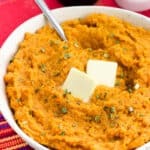 Savory mashed sweet potatoes are smoky and spiced up with pantry staple seasonings and simple to customize to your liking. These easy mashed sweet potatoes make a great side for a variety of main dishes. Peel and quarter sweet potatoes and place them in a medium-large saucepan. Add enough water to the pan to cover the potatoes, along with 1 tbsp of the salt. Place pan over high heat and bring to a boil, then reduce the heat a little bit once boiling. Boil potatoes for 12-15 minutes, or until the potatoes are fork tender. Drain the potatoes and add them back to the pan over low heat for 1-2 minutes, then shut off heat. Add the remaining 3/4 tsp salt, minced garlic, milk, butter, and pepper to the saucepan and mash until smooth. Add the remaining seasonings and mash in, tasting to adjust the spices to your liking. Serve. I used 2% milk here, but any variety (including half-and-half or cream) will do. You can use 4 tbsp of salted butter if you like. If doing so, omit the remaining 3/4 tsp of salt that gets mashed into the potatoes until you take a taste. Then season according to your liking. The recommended spices and seasonings are what I like to use, but feel free to vary the quantities and spices as you see fit.